Glad to announce that the wait is over. The eagerly awaited launch of the GTN token on the DOBITRADE exchange, has been confirmed. 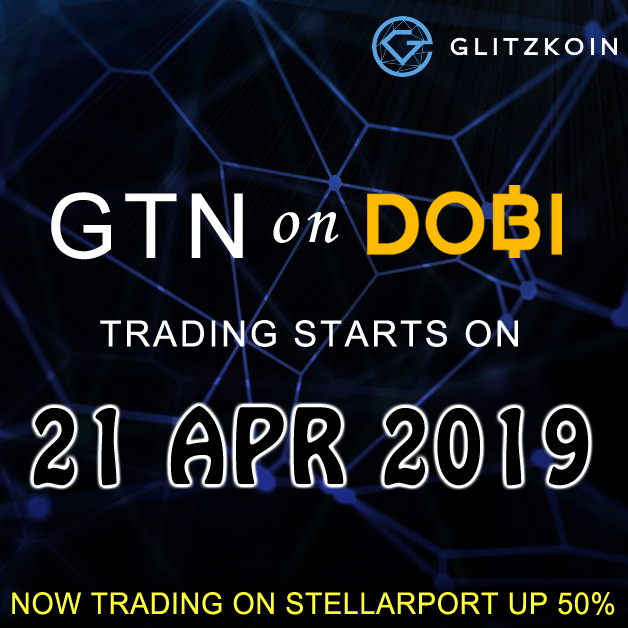 21 April 2019 is the big day for GTN and all the supporters of the Glitzkoin project and token. This is an additional exchange listing which means that, crypto lovers can now trade GTN on Stellarport or DOBITRADE. Crypto analysts would realize that, this is a significant graduation for the GTN token. DOBITRADE is an extremely high traffic, high trade volume exchange. You will all agree that, this is a much deserved boost for a crypto that, has put up an impressive show in some of the toughest times ever faced by the crypto world. There is no doubt that, the GTN token trading on the Stellarport exchange since July 2018, has been robustly supported by the crypto community. So was there any need to explore the possibility of further exchange listings, for one of the best performing cryptos of 2018. Glitzkoin management has always kept its options open regarding, exchange listings for the GTN token. Listing the GTN on the DOBITRADE exchange, further expands the market reach for the token. Glitzkoin CEO and diamond veteran Navneet Goenka, has repeatedly stated that the project, has two distinctly different stakeholders. Diamond traders would be using, the GTN token to pay for purchases made on the DiaEx trading platform. Crypto world participants, form the second group of stakeholders. An increased GTN activity, would have a positive impact on the price of the token. It comes as no surprise that, the DOBITRADE listing has been warmly received by crypto enthusiasts. There is a general belief that crypto space is a closed environment, inhabited by a select group of tech savvy people. The Glitzkoin diamond blockchain project, made a severe dent in that belief. Focused on the 90 billion dollar diamond industry, Glitzkoin has played a leading role in bridging the gap between technology and the real world economy. Demand for the GTN token has been generated by crypto interested minds that go, beyond the crypto world. Conventional stock brokers, Forex traders, Binary traders, financial advisors, real estate agents and many more professionals have actively backed the project. This adds up to a significant number of non-technical investors. The Stellarport exchange on which the Glitzkoin GTN token continues to trade, does present a challenging learning curve for a few prospective investors. GTN token buyers operating on Stellarport, are required to own the XLM (Stellar) token, to pay for their purchases. The DOBITRADE exchange simplifies the token buying process. This by allowing the GTN token to be purchased, using the more popular BTC and ETH tokens. Crypto buyers can also pay for their purchases using the US$ option. The simplified trading process on DOBITRADE will also be helpful, for diamond traders operating on the DiaEx diamond trading platform. As announced by Myticket.asia in early 2019, the GTN token would be one of the payment options on the online ticketing portal. Beginning with a Stellarport listing, Glitzkoin has now added DOBITRADE as one of the exchanges trading the GTN token. In the words of CEO Navneet Goenka, ‘… we will continue our negotiations with crypto exchanges across the globe. Efforts to increase usage for the GTN token are also ongoing, the Myticket.Asia partnership is just the beginning’.